Steel is an alloy, consisting mainly of iron, with a carbon content of 0.2% to 2.1% by weight. Though the use of carbon is most common for the production of this metal alloy, other alloying materials like tungsten, chromium and manganese are also used. The proportions and forms in which these elements are used, affect the properties of the steel that is produced – increasing the carbon content for instance, increases its strength. This fact is particularly useful for making different types of steel for different purposes – the strength of steel needed to make a beverage can, is obviously different from the one needed to make railway tracks. There are various types of steel, and the use of this alloy is widespread across industries and infrastructure owing to its many useful properties and characteristics. Tensile strength is the amount of stress that a substance can take before becoming structurally deformed. The tensile strength of steel is comparatively high, making it highly resistant to fracture or breakage, which is a key point in its use in infrastructure building. One of the useful mechanical properties of steel, is its ability to change shape on the application of force to it, without resulting in a fracture. This property is known as ductility, which enables it to be used in the making of different shapes and structures ranging from thin wires or large automotive parts and panels. Malleability is closely linked with ductility, and allows steel to be deformed under compression. It allows this alloy to be compressed into sheets of variable thicknesses, often created by hammering or rolling. The hardness of this alloy is high, reflecting its ability to resist strain. It is long-lasting and greatly resistant to external wear and tear. Hence it is considered a very durable material. Steel is a good conductor of heat and electricity. These properties make it good choice for making domestic cookware, as well as electrical wiring. One of the physical properties of steel is its attractive outer appearance. It is silvery in color with a shiny, lustrous outer surface. The addition of certain elements, makes some types of steel resistant to rust. Stainless steel for instance contains nickel, molybdenum and chromium which improve its ability to resist rust. In addition to the above, the following is an indicative properties chart, which illustrates the differences in the properties of different types of steel. 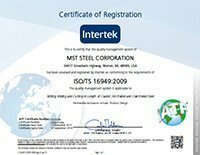 Steel is identified by grades, which are defined by specific organizations that set standards for grading. Mild steel and two grades of stainless steel, 304 and 430 are discussed below. Steel is the most recycled material in North America – close to 69% of it is recycled annually, which is more than plastic, paper, aluminum and glass combined. Steel was first used for skyscrapers in the year 1883. It takes more than the wood of 40 trees to make a wood framed home – a steel framed home uses 8 recycled cars. 600 steel or tin cans are recycled every second. 83,000 tons of steel were used to make the Golden Gate Bridge. The uses of steel are exhaustive and extensive. With recycling of this alloy, a practice that is commonly followed, its environmental impact is greatly reduced. It has been used for making almost everything, right from the implements for agriculture, to building bridges, railway tracks, cars, engines and airplanes. In fact, you’d be hard pressed to go through a single day without coming across this extremely versatile metal. Over the years the production of steel has increased to its current levels of close to 1300 million tons a year. Whether it’s a knife to cut a fruit, an electric razor, a hair pin, or an entire building, there’s a little bit of steel in everyone’s life!